Quote Reply Topic: THANATOS stamps and covers. Thanatos 2018 20th Anniversary of Independence set, in the minisheet format they were issued in. 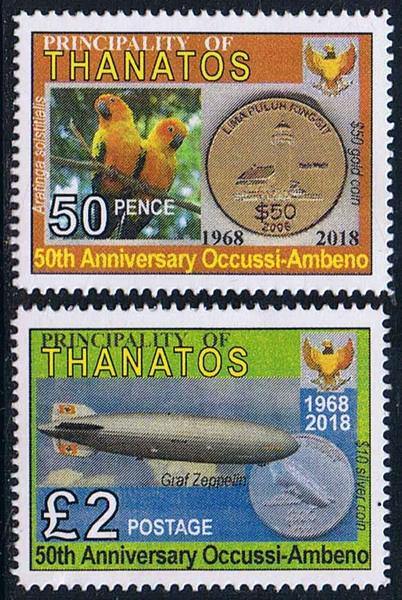 The Principality of Thanatos, a small isle off the British coast, celebrates its 20th anniversary of independence in 2018, and to mark this historic event, this beautiful set of four stamps was issued. 50p ... Passion flower, the national flower. £1 ... Badger, the national animal. £1.50 ... Aerial view of the island. £4 ... the painting "A Dream of Spring" (1901) by William-Adolphe Bouguereau. William-Adolphe Bouguereau (1825 – 1905) was a French academic painter. In his realistic genre paintings he used mythological themes, making modern interpretations of classical subjects, with an emphasis on the female human body. During his life he enjoyed significant popularity in France and the United States, was given numerous official honors, and received top prices for his work. As the quintessential salon painter of his generation, he was reviled by the Impressionist avant-garde. By the early twentieth century, Bouguereau and his art fell out of favor with the public, due in part to changing tastes. In the 1980s, a revival of interest in figure painting led to a rediscovery of Bouguereau and his work. Throughout the course of his life, Bouguereau executed 822 known finished paintings, although the whereabouts of many are still unknown. Bouguereau was a staunch traditionalist whose genre paintings and mythological themes were modern interpretations of Classical subjects, both pagan and Christian, with a concentration on the naked female form. The idealized world of his paintings brought to life goddesses, nymphs, bathers, shepherdesses, and madonnas in a way that appealed to wealthy art patrons of the era. Prince Michael Damian intends this set to remain in use as the definitive stamps of the island for the foreseeable future. 1 Arbor Court, Abingdon Road, Leicester LE2 1HA, England. Apparently, the Prince is amenable to exchanging his stamps for other mint sets. Make him an offer. Speaking of Thanatos, I have just completed one of the most challenging print jobs I have EVER done, on an Adana press. 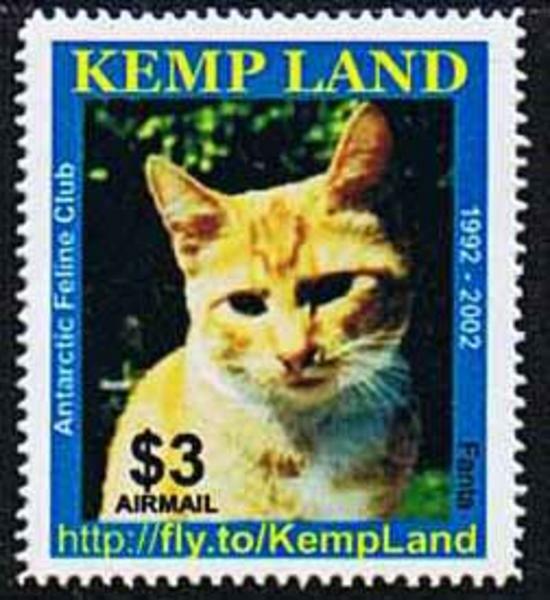 It is a registered mail label, so quite small. The client requested that the name of his town, Tyrsby City, should have a diaerisis accent (2 dots) over the first Y in the 10 point Tyrsby. I don't have ANY accented letters among my fonts at all, so considered getting a polymer plate made for this. But finally, I just printed the name, then ran them through the press a second time and printed a colon on its side in the correct location. A rather tricky make-ready to do that one! I hope I don't get asked for cedillas next! That would be trickier! Front cover of the booklet of Registered mail labels, Tyrsby City. 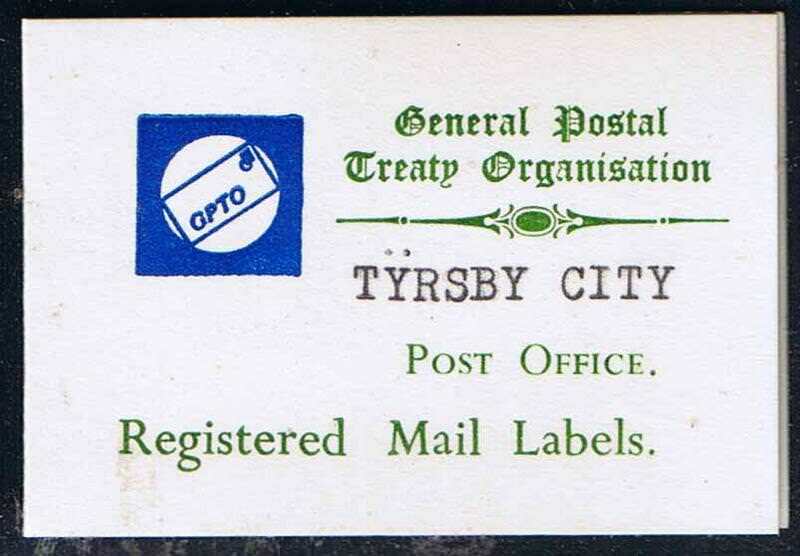 Registered mail label for Tyrsby City, Thanatos. Thanatos 2018 50th Anniversary of Independence of the Sultanate of Occussi-Ambeno. The Principality of Thanatos issued this set on 8th April 2018, to mark this historic event for their good friend and ally, Occussi-Ambeno. The issue date was Occussi-Ambeno's independence day. The port town of Oekusi was established in the 15th century as a provisioning station for Portuguese privateers. Until recently Oekusi was the seat of power ("government"). All administrative functions are now carried out in the much more recently established town of Pante-Makassar, 20km north east of Oekusi. In 1985, the Sultanate was admitted to the International Council of Independent States (ICIS), the "United Nations" of the Fifth World, and has since played a leading role in that forum.